Vitale Valocchi first appears in the Painesville, Ohio, area in 1913. In America, Vitale Valocchi was known as Vitale Valocchi. Vitale Valocchi, son of Pietro Valocchi and Lucia Lizzi, was born on October 20, 1896, at Campli, Italy. He married Antonella Lucrezi, daughter of Venanzio Lucrezi and Marianna Rinzi, on February 16, 1922 at Painesville, Lake County, Ohio. Antonella was divorced and had two children when she married Vitale. Antonella died less than one month after marrying Vitale. Vitale married second, Mary Martone, in 1927. 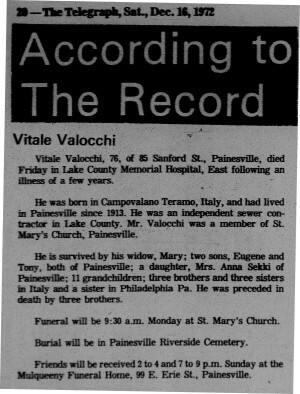 Vitale died on December 15, 1972, at Lake County Memorial Hospital East, Painesville, Lake County, Ohio, at age 76. His body was interred at Riverside Cemetery at Painesville, Lake County, Ohio. Vitale Valocchi, age 15, immigrated to the United States on March 28, 1912, travelling to Mononagah, West Virginia. He was joining his sister, Grazia Valocchi. Vitale Valocchi established residence in Painesville, Ohio, in 1913. Three of Vitale’s brothers would eventually join him in Painesville: Mattia in 1915, Nazareno in 1917, and Geremia in 1920. 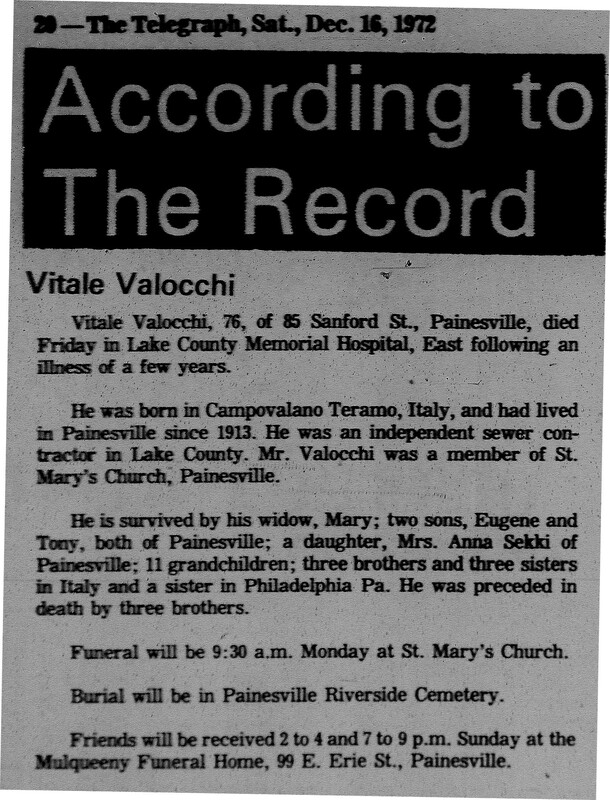 Vitale Valocchi became a citizen of the United States on September 21, 1936. Vitale resided at 477 Henry Street, Painesville, Lake County, Ohio, when he was Naturalized. Vitale Valocchi was employed as an independent sewer contractor. There were no children of Vitale Valocchi and Antonella Lucrezi. 1. Eugene L. Valocchi was born on May 11, 1929, at Ohio. He married Mary C. Marzano, daughter of Domenico Marzano and Sarah Catonzaro, in 1953 at Barbour County, West Virginia. 2. Anna L. Valocchi was born on January 11, 1932, at Painesville, Lake County, Ohio. She married Dale Sekki, son of Edwin Sekki and Mary Storage, on August 11, 1951 at St. Mary Catholic Church, Painesville, Lake County, Ohio. 3. Anthony Peter Valocchi was born on October 31, 1938, at Painesville, Lake County, Ohio. He married Carmen Imes, daughter of Franklin G. Imes and Ruby Blackart, on July 18, 1959 at Painesville, Lake County, Ohio. Anthony Peter died on November 2, 2003, at his home, Saybrook Township, Ashtabula County, Ohio, at age 65. His body was interred at Saybrook Cemetery at Saybrook Township, Ashtabula County, Ohio.